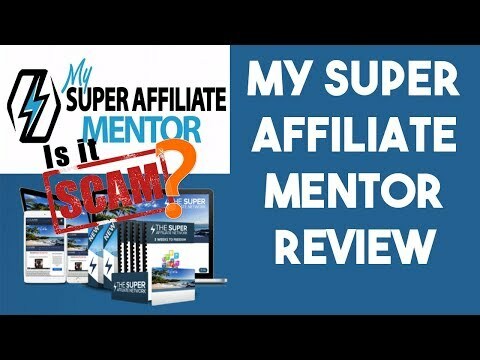 My Super Affiliate Mentor Review - LEGIT Way To Earn Money Online Or a SCAM? My Super Affiliate Mentor Review – LEGIT Way To Earn Money Online Or a SCAM? Welcome to my Super Affiliate Mentor review. I recently came across this from an email I received. If you're reading this, I'm assuming you're asking the same question that I was when I first saw it. Is this an actual legit way to earn money online? Or is it just another scam? I dug a little deeper into the website and did some investigation for you. So here we are again, with another product running through ClickBetter. If you've read my other review like my 60 Minute Profit Plan review then you know that generally, I don't trust anything on there. They are usually always scams. So, I'm instantly feeling very sceptical about My Super Affiliate Mentor. However, I will give it the benefit of the doubt while I investigate further. Even though it is possible to get a refund with ClickBetter, it does take a while to get your money back, and it is quite a tedious process. My Super Affiliate Mentor claims to be a free, easy to use system that will make you thousands of dollars easily with little to no work. Most of it will be done on autopilot for you. Once again, I've said this time and time again, nothing is that easy. You can't expect to pay a small amount of money and start earning passive income automatically. It just doesn't work like that. So, anyone who says that's how a system they're selling works, don't believe them and don't trust them. They are misleading you. Their only goal is to get your money. They claim that their system is a super secret method and you are very lucky to have stumbled upon it. More tricks that they're using to get your money. What Exactly Is My Super Affiliate Mentor? Surprise, surprise.. All My Super Affiliate Mentor is, is a sales funnel for The Super Affiliate Network. Just like My Super Affiliate Success System. The Super Affiliate Network? What's That? If you don't know what The Super Affiliate Network is, it's just another very high ticket business opportunity, just like MOBE, which I talked about in my Secret Society of Millionaires Review. The Super Affiliate Network is a legit business opportunity, however, I never recommend it because of how high ticket it is. It will cost you thousands and thousands of dollars before you can even attempt to start earning money online. There are monthly membership fees involved, as well as having to buy into incredibly expensive products before you can actually have the rights to sell and make commissions off of. Self Promotion. That's what The Super Affiliate Network is all about. Their training will basically be training you how to self promote and sell others into buying a The Super Affiliate Network membership. Honestly, it's very similar to a pyramid scheme. It's very cheap to start off with. However, you can't make any money at all with only their initial fee. You have to purchase one of their memberships to actually start attempting to earn a penny with them. The higher the membership you purchase, the more commissions you can earn by getting other people to buy into it. If you only have their “Basic Membership”, you will be unable to make any money off of sales for their “Annual”, “Plus”, or “VIP” memberships. Their “Basic” membership is the only one that you'll gave the license to sell. This is called a “licensed rights” deal that is very common with high ticket programs just like this one or MOBE. The Verdict – Is My Super Affiliate Mentor a Scam? With most of my reviews, I can't really say they're a scam as you do actually get a product from it. However, I almost never recommend them because of how misleading they are and how many lies they tell. My verdict is no different with this one. I would not say this is a scam. But, I absolutely DO NOT recommend buying into this program. So that's it for My Super Affiliate Mentor review. Thanks for reading. Watch My Super Affiliate Mentor review video below and don't forget to subscribe to the YouTube channel. 60 Minute Profit Plan Review – Scam or Legit? The Job Quitter System Review – QUIT Your Day Job?! SCAM!